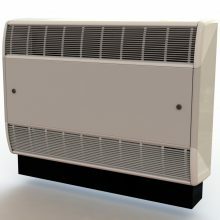 SPC have launched the Belgravia Supreme Plus fresh air inlet fan convector, for enhancement of indoor air quality in classrooms. The unit, which is based on the successful Belgravia Supreme, is specifically designed to improve indoor air quality for its users. The unit can be controlled by a C02 sensor which determines whether fresh air is needed, by monitoring the air quality within that room. On demand, the outside damper lets in fresh air when required by introducing and warming the air and mixing it with recirculated room air. The outcome is a healthier working environment, alert pupils and a more productive working day. “The launch of the Belgravia Supreme Plus is a natural progression of the Belgravia Supreme. This unit successfully marries the style, innovation and efficiency of the popular Supreme with the added ability to offer a more comfortable indoor environment”. “SPC can offer the most cost effective way of bringing a classroom up to temperature with the correct amount of fresh air with a versatile, durable and a practical long term heating solution for schools, with both floor and wall mounted options available”. It isn’t just schools, colleges and universities that benefit from SPC’s Belgravia Fan Convectors, they are also a perfect heating solution for churches, libraries, sports halls, hotels, hospitals, leisure centres, retail, office and industrial buildings. Call our sales team today on 0116 2490044 or visit our websitewww.spcoils.co.uk for more information on Belgravia Fan Convectors along with our full product range that includes Heat Pumps, Radiant Panels, Air Curtains, Trench Heaters, Coils and Heat Pipes.